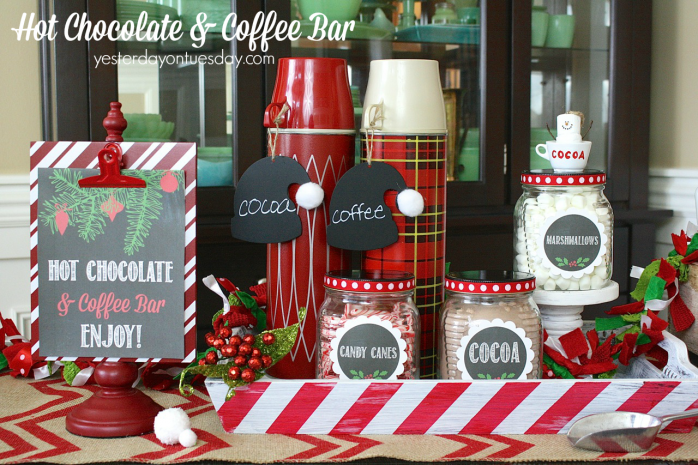 A Hot Chocolate and Coffee Bar is a great to welcome guests over the holidays! 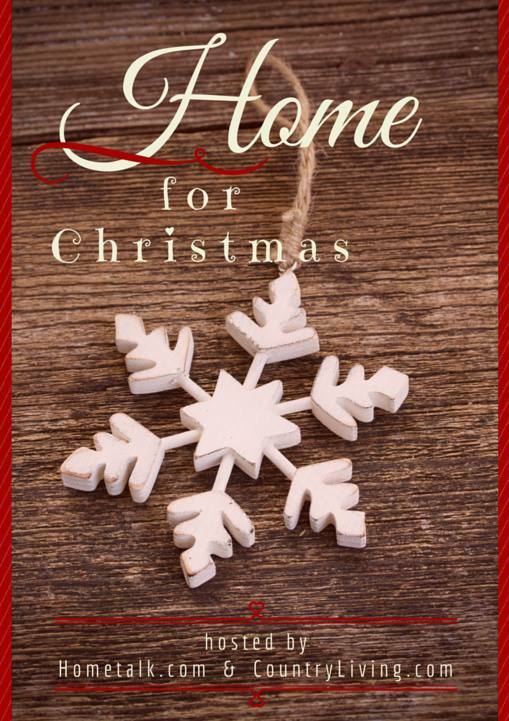 I’m excited to be part of this Home for Christmas event from Hometalk and Country Living. 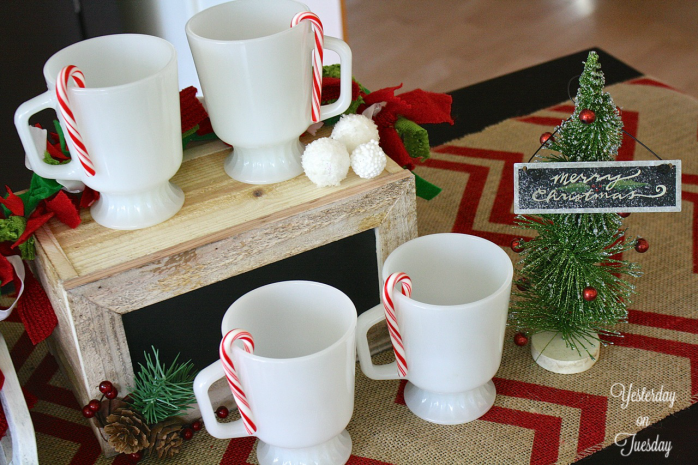 It’s just one of many fabulous Christmas ideas from Hometalkers. Check them all out at the bottom of this post. 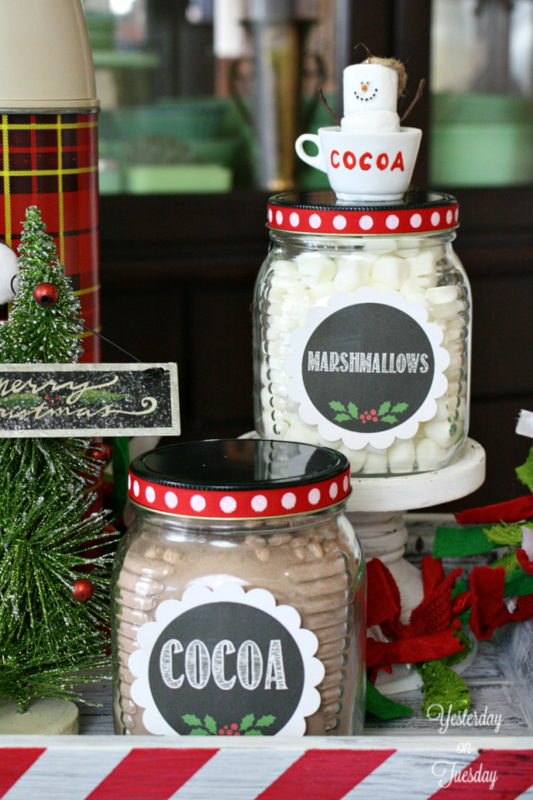 When I was thinking about creating my perfect Hot Chocolate and Coffee Car, I knew my first stop would be my home. 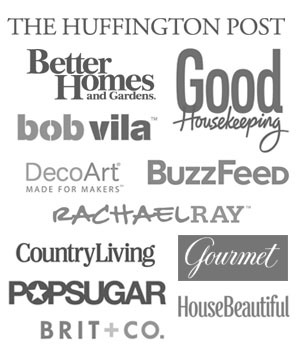 With a quick mosey around the house, I found almost everything I needed. 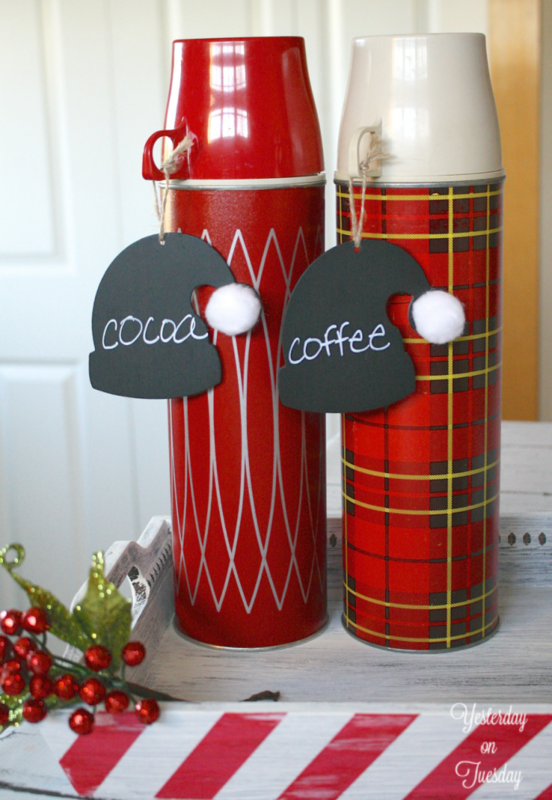 First stop– my project room where I grabbed two vintage thermos. I scored them at a flea market years ago, and I’ve been waiting for the perfect time to put them to use. Hiding in my laundry room… a wooden tray. I think it’s at least 15 years old and long overdue for a fresh look with some paint! The vintage red shade is Americana Decor Romance and the Warm White Acrylic Paint from DecoArt were already in my paint stash. 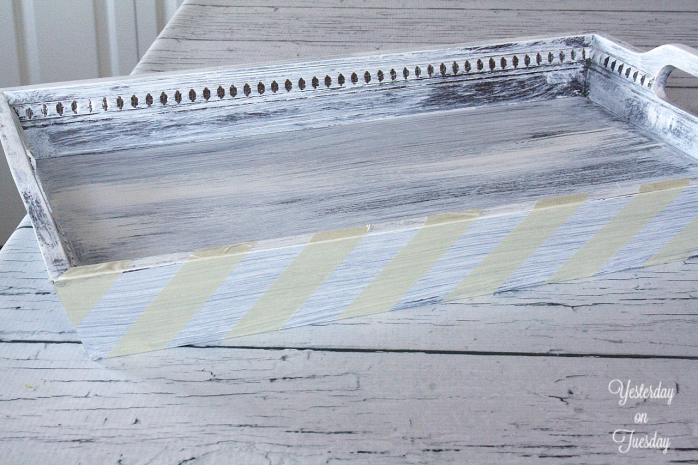 The masking tape was waiting for me in my kitchen junk drawer. 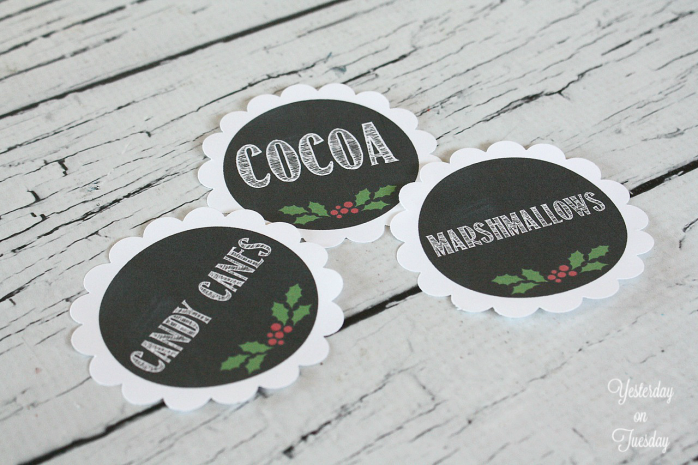 I also had a couple of chalkboard tags from Michaels that I bought not knowing what I would be using them for. 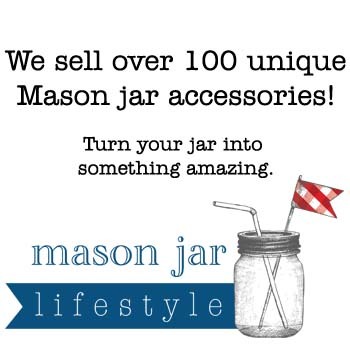 The jars are new. 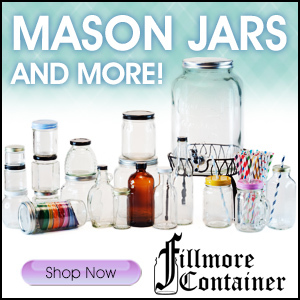 They’re the 32 oz Cracker Jars from Fillmore Container. The silver lids they come with are so pretty, but for this project I used Black Metal Lids. 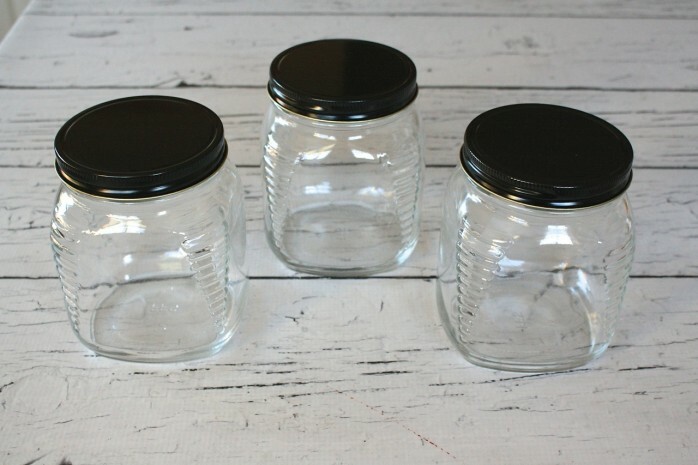 After the holidays are over, my plan is to reuse these stylish jars in the pantry– with the silver lids. To round off my project, I did a quick scan of my Christmas decorations and put anything I thought might work in a pile. 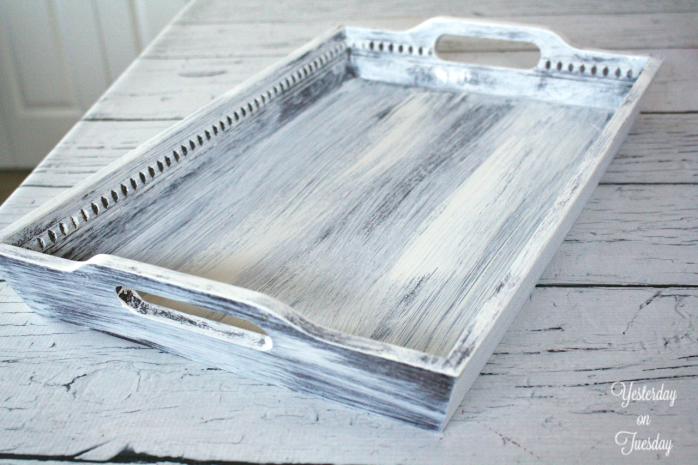 My first task– tackling that tray! I wanted to give it a festive yet rustic look. 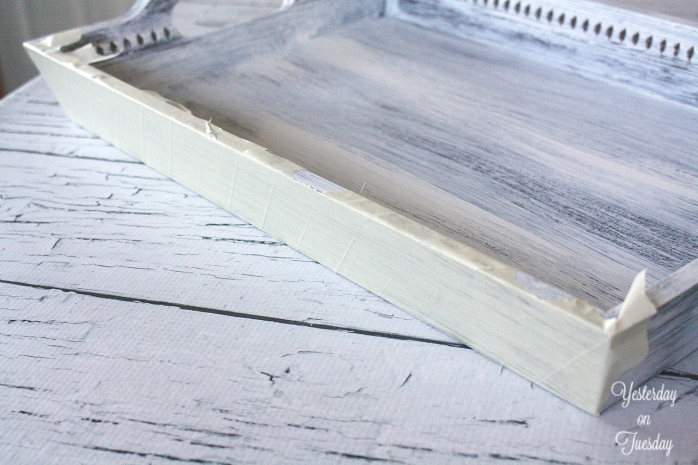 I gave the tray a quick coat of Warm White, purposely letting the dark wood show through. 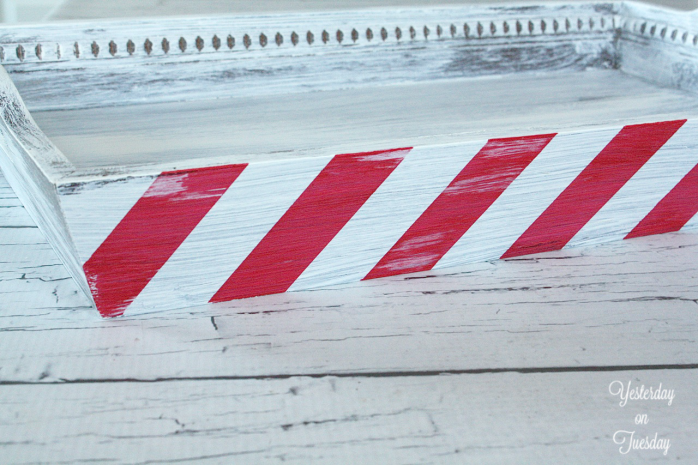 Next, I used my trusty masking to make diagonal stripes. 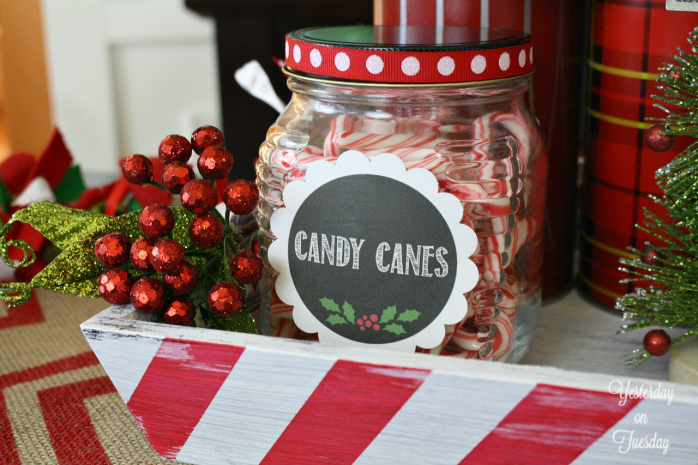 I wanted to mimic the look of my favorite holiday treat… candy canes. 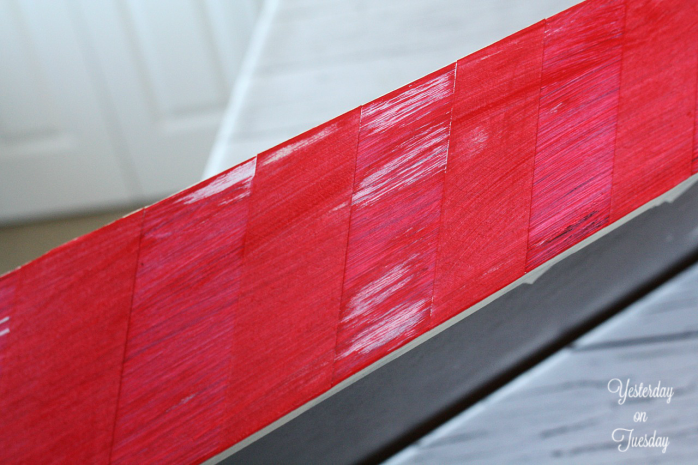 I lined the tape up across the tray and then removed every other tape strip while the paint was still wet. Then I gave it a light swipe of Romance. Ta Da! 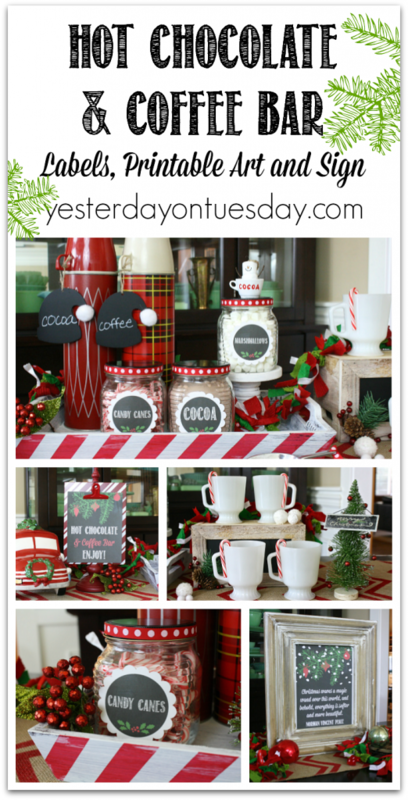 A cute candy cane striped tray for free. 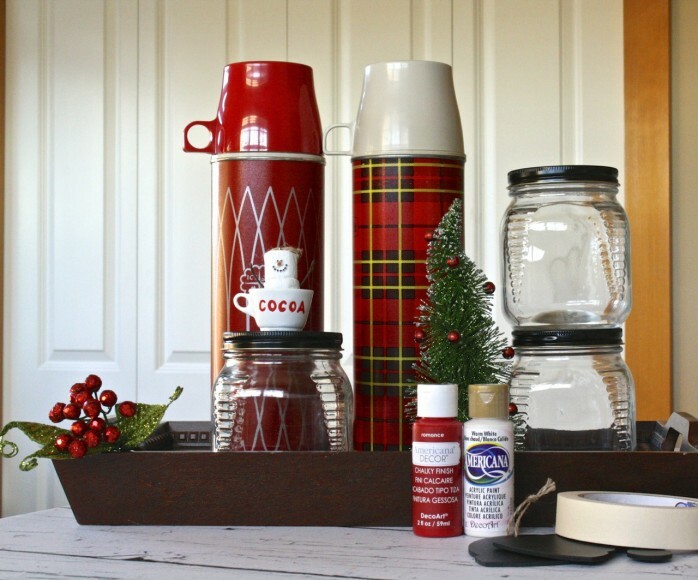 So I had the tray, the two thermos and those fabulous jars. 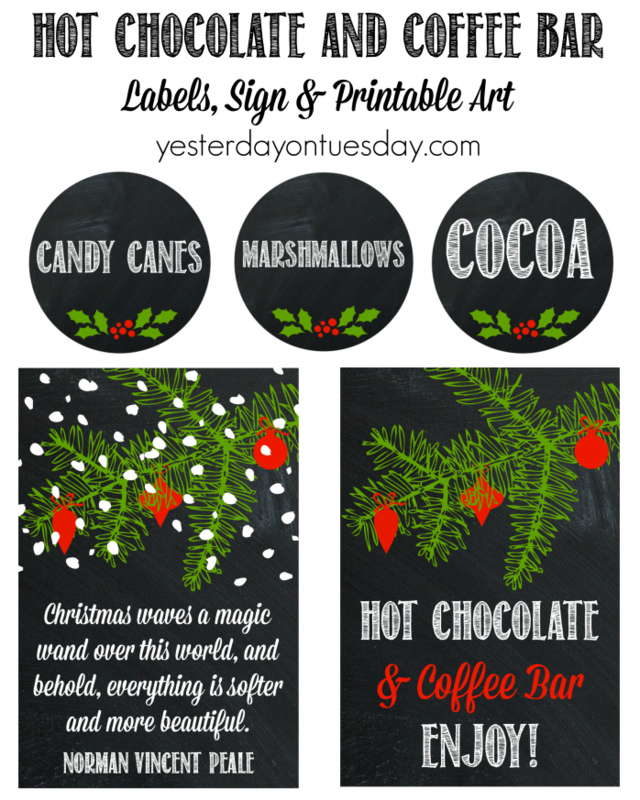 I figured some cheery Christmas printables would help tie everything together. I am a huge Norman Vincent Peale fan. I probably reread my great-grandmother’s original copy of his book The Power of Positive Thinking once a year. 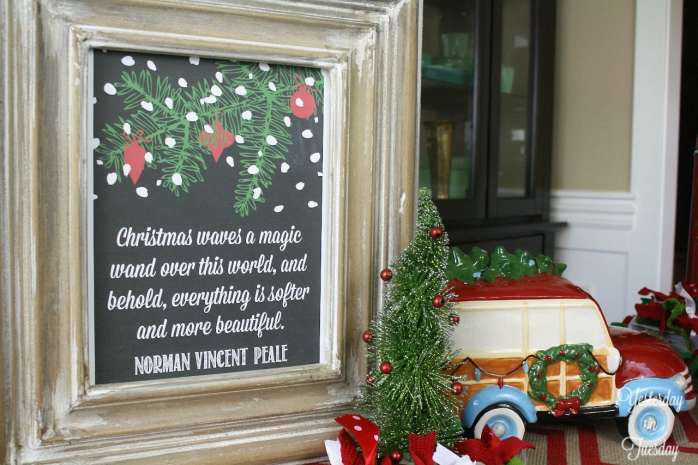 I decided to use a quote from Peale to make some printable Christmas art. 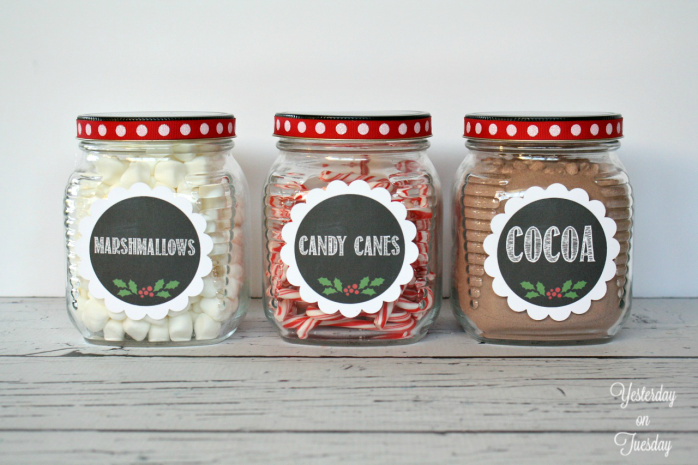 I also wanted labels for the jars and a little sign for the beverage bar. 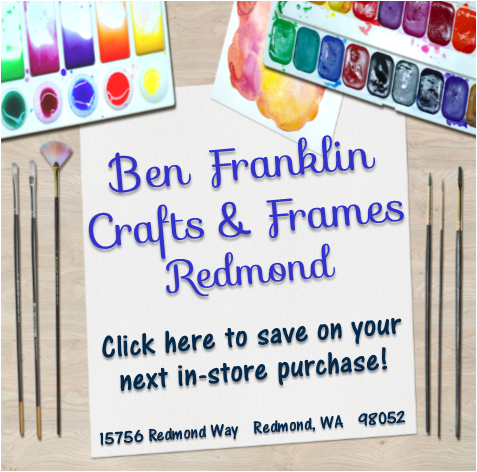 I used a 3″ scallop edge circle punch to punch the labels out. Glue Dots held the red ribbon and labels in place. 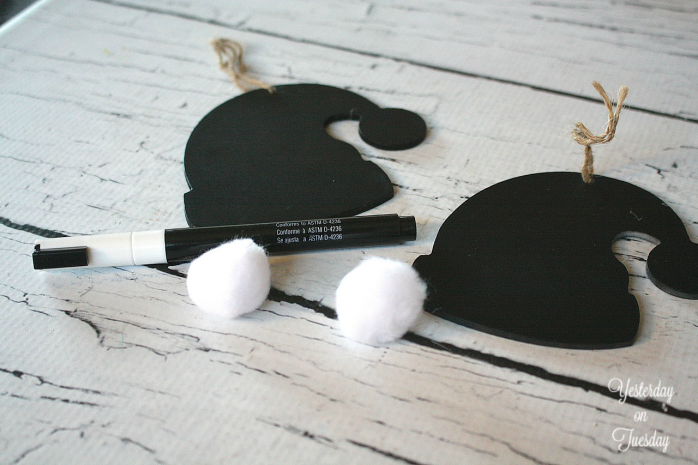 A couple pom poms and chalk pen made for an easy upgrade to the tags. Just a little touch to make things even cuter. Here’s the spread with the sign. I collect white milk glass, so this was a perfect opportunity to use it! Here’s the printable art in a frame. More close ups of those lovely jars. 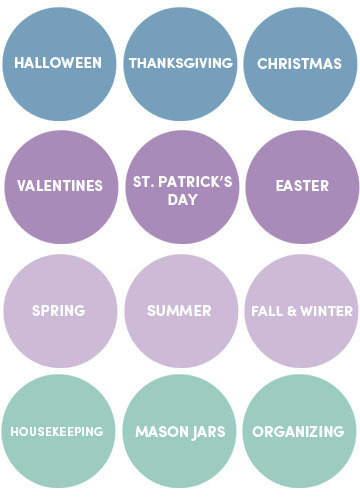 This is so cute, and I love the printables – pinned it! 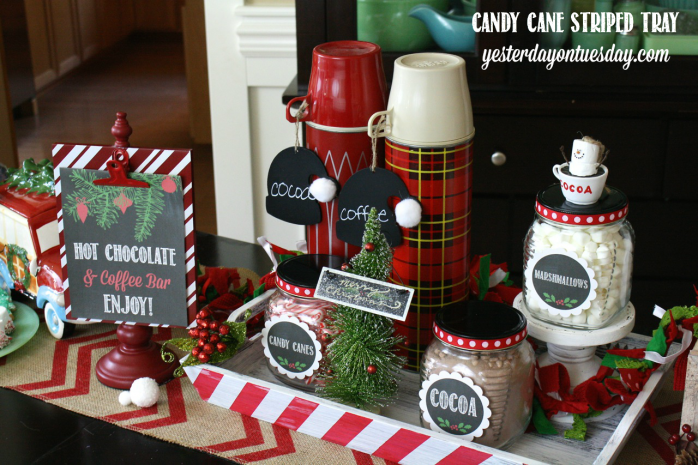 What a great hot chocolate bar – I have always wanted to do one at our place! 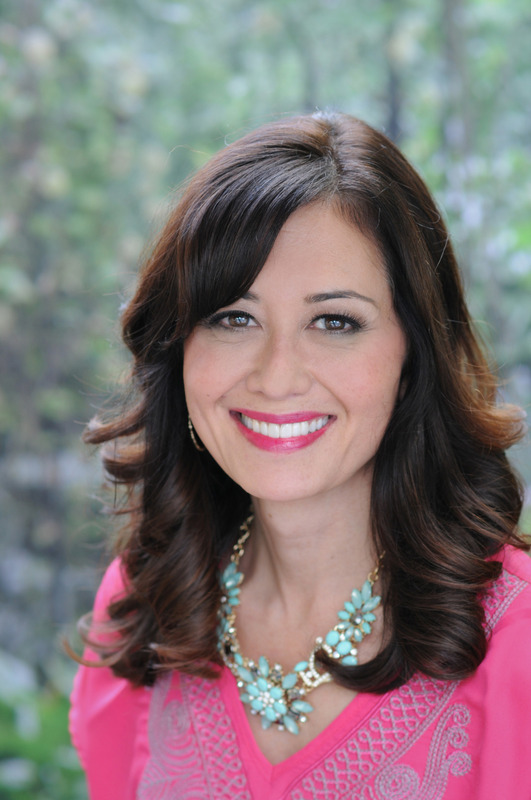 Yours is so festive and fun! What a great set up! I think I have the same thermos’s!!! Extremely inviting and so festive for those dreary winter day! So cute, Malia!! Happy we are on this awesome hop together! Just as darling as can be! Love how it turned out. Great set up and I think it’s time I buy a thermos or two!